There are three words I’ve noticed I use a lot when coaching someone. Those words are “Even, and especially”. Even, and especially is magical. It’s an invitation to look in those places where you don’t think to look — and to make a special point of doing so. Even, and especially is there as a reminder that our work often resides in the areas we are most certain we’ve gotten handled. Take a look at where you’re judging people. Start noticing you’re judgments. Even, and especially, in the areas where you’re certain you aren’t judging people. You have a pet place where you’re certain you’ve stamped out this part of your ego. 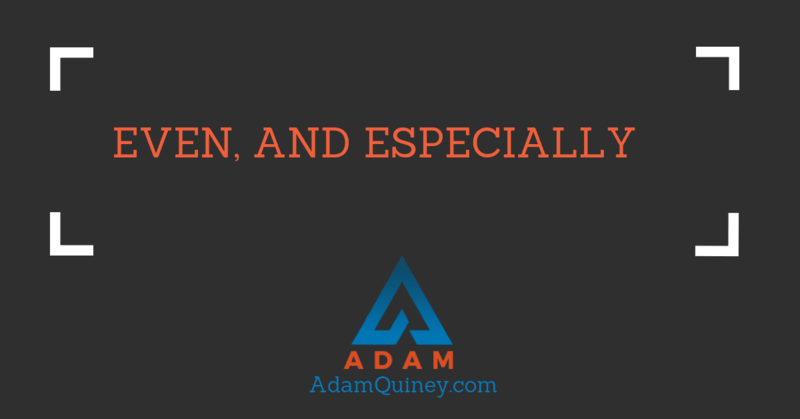 Coaches tell me over and over again that the scarcity they have for money isn’t showing up in their conversations with clients (“That’s definitely not the thing getting in the way, Adam.”). Parents tell me they don’t have judgments of their kids, only of themselves. Executives promise me they aren’t bringing the same kind of ruthlessness to their family that they’re bring to themselves. Take a look — even, and especially, in those areas where you’re certain this isn’t a factor. Even, and especially serves as a reminder that you’re only as safe as you’re able to accept that your ego will always get the best of you. Even, and especially is your safeguard against generating the kind of awareness that is safe, known and utterly irrelevant to your transformation. Even, and especially represents the key to unlock the door of transformation through which you wish to walk. When you take a look in the areas demarcated by “even, and especially”, you look in the darkest recesses of your blindspots. You may be a mess in these other places, but look over here: you’ve got your room all cleaned up and there is nary a spot out of place. Look there — even, and especially. When we aren’t willing to look in the “even, and especially” areas, we tend to try to generate awareness in the places that we already see our patterns. If I give you the practice of noticing where you are cruel to people, you will probably immediately come up with a few places where you know you do this. These are the safe areas. These are the places where you have come to some kind of peace with your shadow and are willing to let it play. You already know how your ego works here. This is not the place to end your quest for awareness. Look outside these areas. Look in the places you are convinced are safe-houses for your highest self. Look in the areas where you least want to see your shadow side. Look in the areas where you are most resistant to seeing your nastiness. Even, and especially, when you don’t think there’s anything to be found.